Our one of a kind true NYC Style Pastrami Sandwich. 1/2 lb of pastrami. served with coleslaw and pickle. 1/2 lbs of turkey, tongue and swiss on a bread of your choice. 1/2 lbs of tongue. served hot, please specify if otherwise. 1/2 lbs of turkey, chicken liver, & tomatoes. /2 lb of homemade Roast beef, served with a bread of your choice. 1/2 lbs of corned beef made from scratch on a bread of your choice. Homemade chicken salad on a bread of your choice. 1/2 lbs of freshly sliced turkey breast on a bread of your choice. 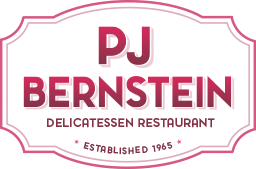 PJ Bernstein's world famous roast beef sandwich! Made in-house egg salad on a bread of your liking. Homemade with corned beef, swiss cheese and sauerkraut with Russian dressing. 1/2 lbs of corned beef, pastrami, & salami. Made daily fresh shrimp salad. 1/2 lbs of homemade chopped liver served on a bread. Homemade meatloaf made daily and served with a bread of your choice. 1/2 lbs of tongue, pastrami, & salami. 1/2 lbs of turkey, bacon, lettuce, & tomatoes. NY's finest grilled cheese sandwich. Freshly made tuna salad with melted cheese and grilled bread. 1/2 of turkey, chopped liver, & pastrami. Fresh salami sandwich on bread of your choice. Choice of any three deli meats freshly sliced for your liking. 1/2 lbs of salami, turkey, & swiss. 1/2 lbs of roast beef, tongue, & salami. A choice of 3 cheeses of your pick on a bread of your pick. 1/2 lbs of tongue, swiss and corned beef. 1/2 lb of fresh liverwurst on a bread of your choice.